In 1900 Jacob Salzinger (1897-1973) was the 2-year-old son of Louis Salzinger living on Delancey St., downtown on the east side of Manhattan. Louis Salzinger was a sign maker who had immigrated from "Poland" in 1895. Louis Salzinger appears in Trow's New York City Directory in 1898 as a sign hanger living on Sheriff St. He established a hardware business on Delancey St. around 1900, but around 1903 this was taken over by his wife, Rose Salzinger, who moved the business to 55 Orchard St. Directory lists describe the business as either hardware or sign painters' supplies. From 1910 to 1920 the business at 55 Orchard was also listed as L. B. Salzinger, "sign supplies" or "scrap iron." L. B. was probably Jacob Salzinger's brother, Louis Salzinger (born Sept. 1891). 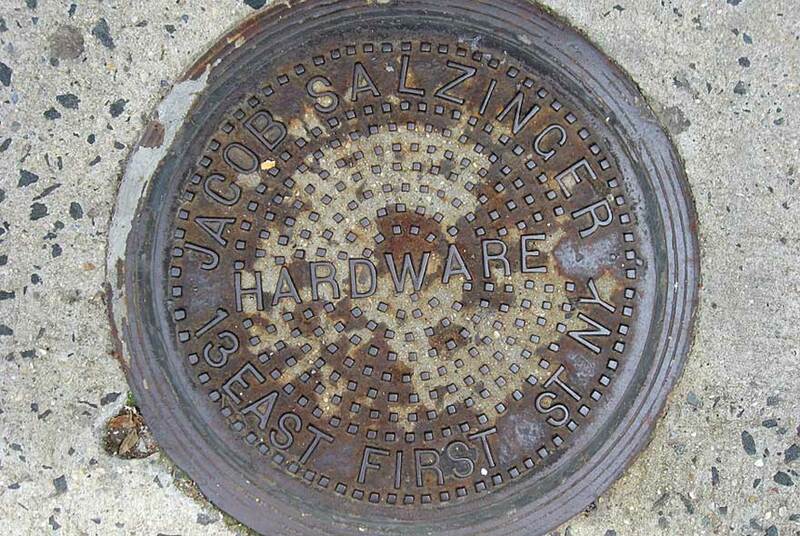 Jacob Salzinger is first listed as "hardware" at 55 Orchard St. in 1925. Within a year of this date he moved to 13 E. 1st St. Jacob Salzinger, Hardware, was listed in the New York (Manhattan) telephone directory at this address from 1926 to 1939. The business was also described as "angle irons" and "sign accessories." In 1940 they moved to 300 Ave. A, then seem to have closed after 1942. Jacob Salzinger registred for the World War I draft in 1918, when he worked as a manager at United States Shipping Board, whose home office was located in Boston. He was recorded in the U. S. Census reports of 1920 and 1930. In 1920 he lived with his widowed mother on Wilson St. in Brooklyn. In 1930 he had his own family and lived on E. 3rd St., Manhattan. In 1942 he registered for the World War II draft when he still lived on E. 3rd St. In this registration he gave his date of birth as 14 Jan. 1897, and said that he was self-employed at 300 Ave. A., New York, NY.